Just because the current iPad doesn’t have a camera, doesn’t mean it can’t touch up photographes. 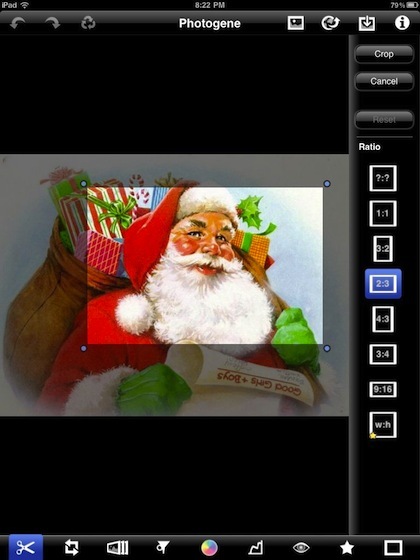 Using images from the cloud storage, iPhone sync, the Camera Connector or via email, a photo in your iPad can be heavily customized. 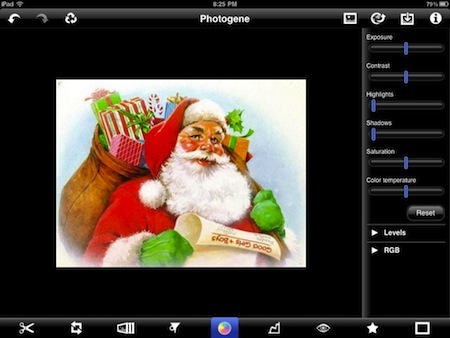 We have mentioned Photogene before as an app that we use for cropping and adjusting colors/levels of photos on our iPads. The app can actually do considerably more. Several of the features you would expect to do in iPhoto on your desktop can be done with your finger on the iPad… all of these features are supported in landscape and portrait. 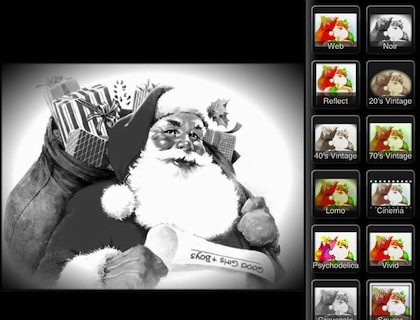 There are two tabs of Filters and Macros available in Photogene for the iPad. These tabs are brought up via the lower icon bar. 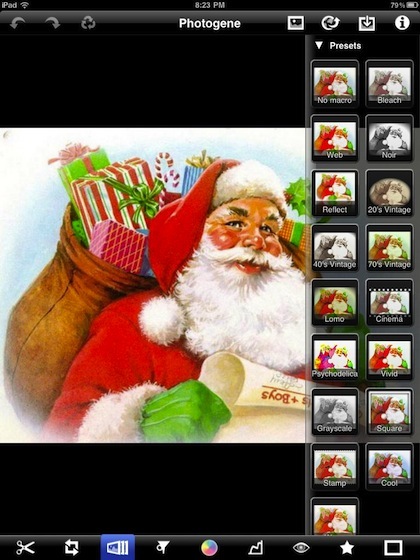 Each filter can be used by selecting the option and then undone if the effect isn’t right for your liking by choosing the ‘No Macro’ or ‘Original’ buttons. 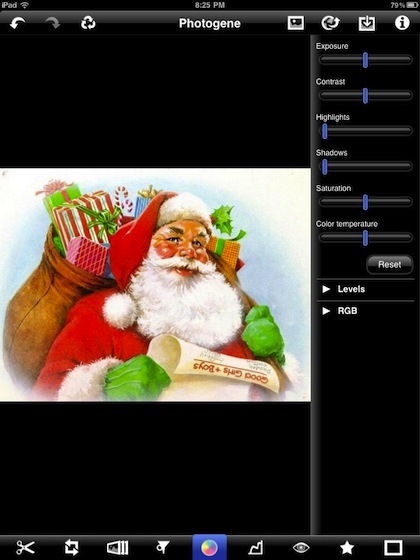 You are also able to apply multiple filters from the Presets. If you see yourself using that same group on multiple pictures, there is a ‘Custom’ area that saves your ‘last used’ filter set. A natural for this particular image is the 20’s Vintage option. Changing the colors and adding an outline. 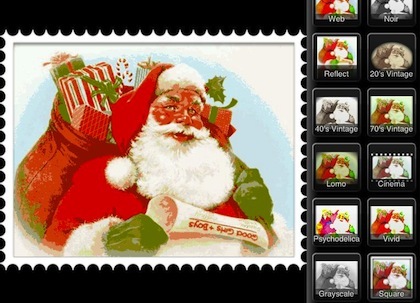 With one tap, Photogene changes an image into something that will drop right onto a nice card or Web site. Several of the filter options will give you an edge. This is not an actual frame (included in another options tab), rather it is an adjustment to the image and outline to create the effect. This one makes the image look more like a postage stamp (you can add text from another tab) while the Cinema button trims the top/bottom and adds a film feed boarder. Noir is a often used term and seldom used feature. 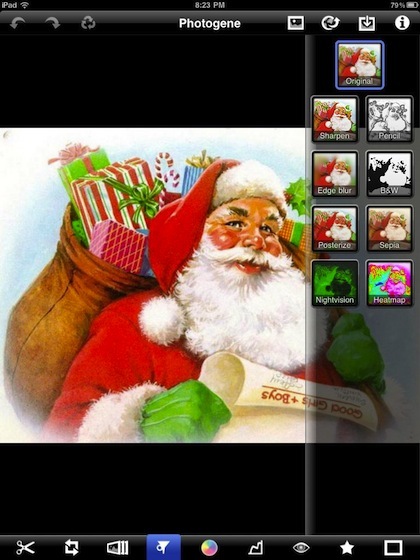 Photogene offers it as an option that should always be tested just to see the difference in the image and visual impact. Since undoing the filter is as easy as choosing the ‘original’ option, playing with the many options is quick to do and will usually give you a look you may not have thought of. 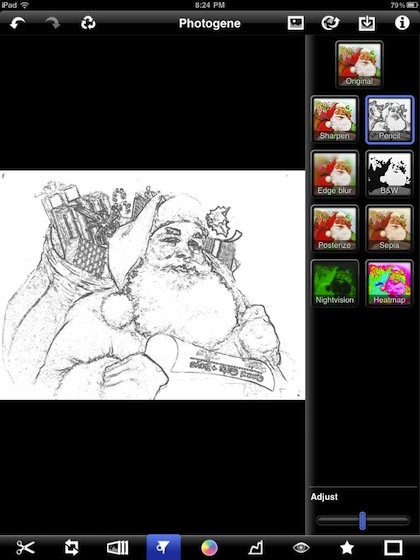 Converting an image to a ‘pencil’ like drawing is a single button push. You can adjust the amount of detail with the slider at the bottom of the options tab. For this image, the pencil effect actually works well if you where using the image as a letter corner highlight. 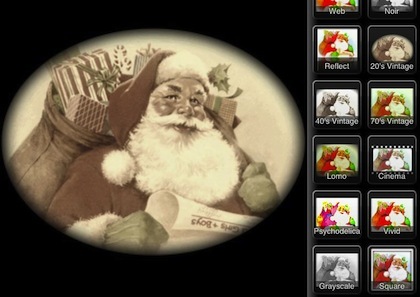 A nice selection of picture frames is available in Photogene as well. This is a ‘most often missed’ feature when creating images to be used for printing. Frames can set an image off or accent it above other points that can effect the viewing dramatically.